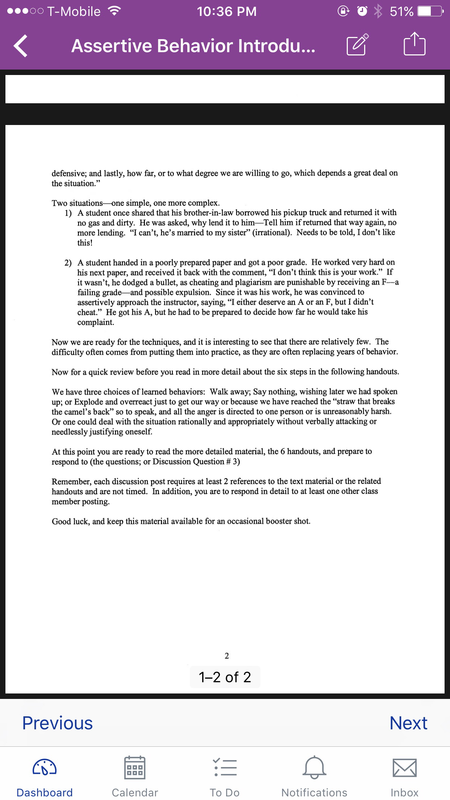 Essay 4 - Assertion Discussion — Reflections on Assertiveness( NOTE) There will be a essay 4 handout in class that will encompass the below discussion, but that will also include ethical/moral and philosophical parameters of assertion and responsibility and to discuss change personal, and what is possible in our groups and environment. The below is an example of subject matter and real life persona instances that we all can relate to. Political correctness is it friend or foe to Assertion and honesty? WAIT for the paper to be given with introduction in class. 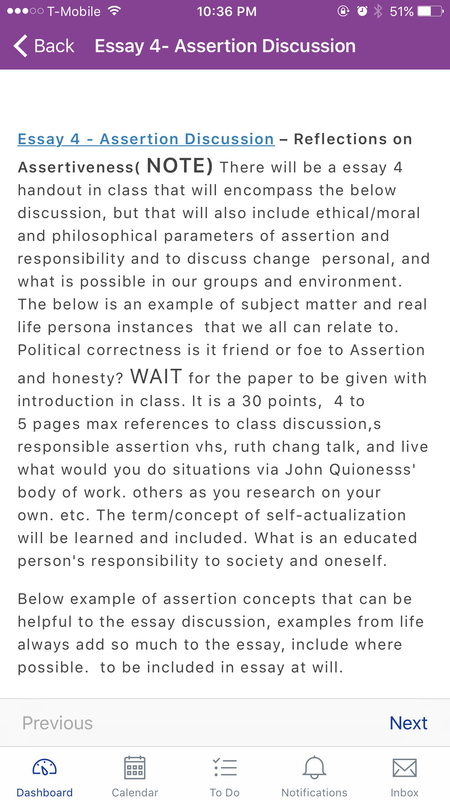 It is a 30 points, 4 to 5 pages max references to class discussion,s responsible assertion vhs, ruth chang talk, and live what would you do situations via John Quionesss' body of work. others as you research on your own. etc. The term/concept of self-actualization will be learned and included. What is an educated person's responsibility to society and oneself. Below example of assertion concepts that can be helpful to the essay discussion, examples from life always add so much to the essay, include where possible. to be included in essay at will. the non-assertive or aggressive behavior. assertion may not be an effective choice. Include at least two references from the Assertiveness training materials. In your personal examples, both rights and irrational thinking must be discussed. 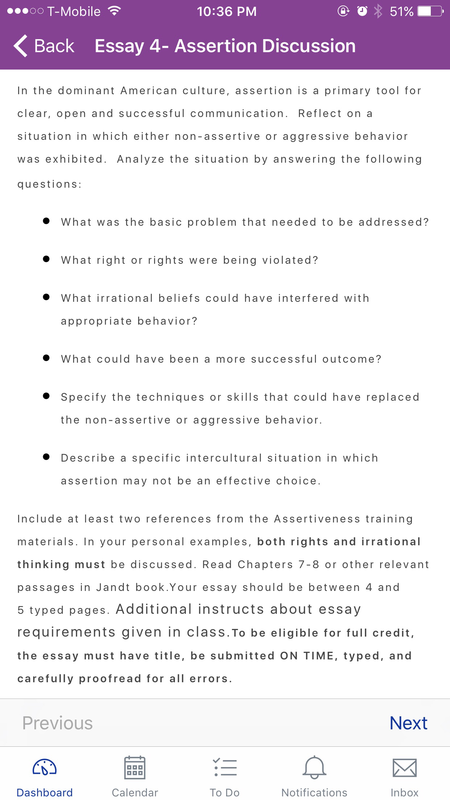 Read Chapters 7-8 or other relevant passages in Jandt book.Your essay should be between 4 and 5 typed pages. 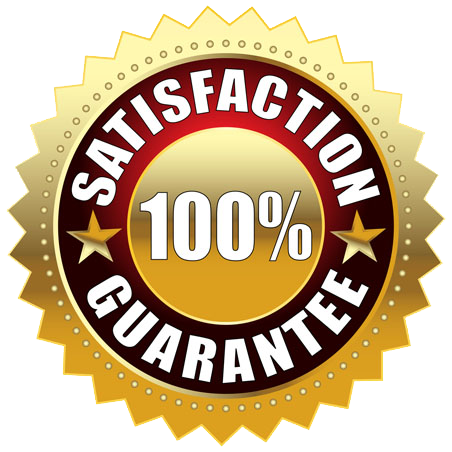 Additional instructs about essay requirements given in class.To be eligible for full credit, the essay must have title, be submitted ON TIME, typed, and carefully proofread for all errors.